To see all of the titles that are currently in your collection, use the Title status & usage report. In the "Report options" window, change the "Period Type" to Specific. 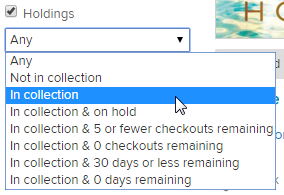 Leave the start date and end date fields blank to see all titles added since the inception of your collection. Or, select a start date and end date to see only titles that were added to your collection for the first time during that date range. The report will show details for all of the titles added to your collection during the date range you chose. Learn more about using the Title status & usage report to determine your library's holdings here. Search or filter by "Holdings"
Use the "Holdings" search field (in advanced search) or the "Holdings" search results filter to just see titles in your collection (or not in your collection). Note: If you're signed into Marketplace as an Advantage library, you'll see "Holdings" filters for both your Advantage and consortium collections. In search results and on title details pages, you can see whether your library already owns an individual title and whether that title is pending (but not yet purchased) in another cart. Learn more about Own, Out, Holds, Holds ratio, and Pending numbers here. If there's a colored dot next to a figure, you can click it for more information (for example, to see how many licenses are left for a Metered Access title). On the first line, "Adv Plus shared" is the number of copies of that title that all Advantage members have shared with the shared collection. Advantage accounts will also see an "Adv Plus shared" figure on the "Advantage" line, which is the number of copies from your Advantage collection that have been shared with the shared collection. To see figures for your Advantage collection only, make sure you're signed into your Marketplace Advantage account. Copies shared through Advantage Plus are counted towards the shared collection's holds ratio. You can open any of your carts to see which titles in that cart you already own (Own columns) and which titles have also been added to other carts for your library (Pending column).